Growing up in central Oregon, allowed me to experience such a diverse amount of habitat, and the wildlife that resides there. It is a high desert, with sagebrush flats, surrounded by Ponderosa Pines, yet we still have large waterways, for waterfowl and shorebirds. Many refuges in this part of the state, like Malheur refuge, Summer Lake Refuge, and Tule lake Refuge all get the lion’s share of acclaim, and publicity, and deservedly so. 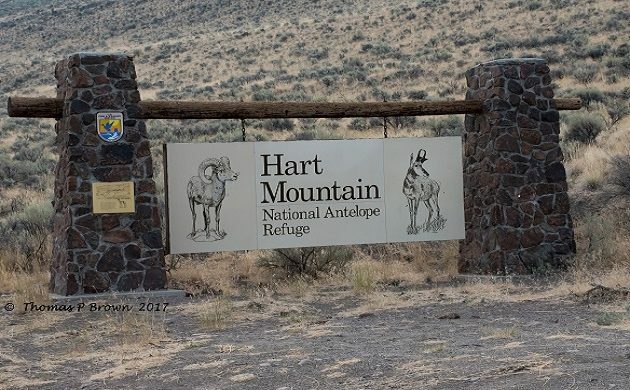 For me, the real jewel of central Oregon is Hart Mountain National Antelope Refuge. 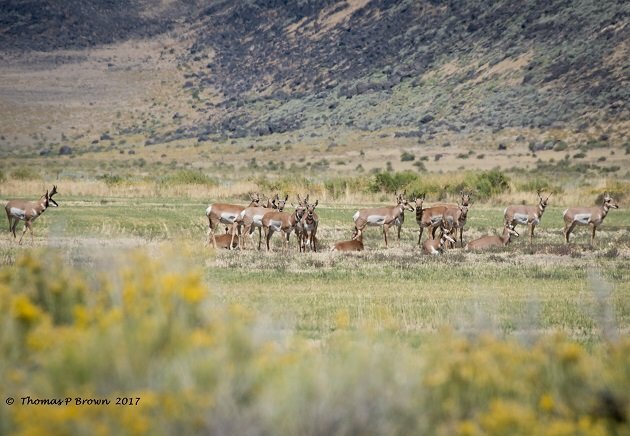 Established in 1936, as a refuge for the last remaining herds of Pronghorn Antelope, this amazing piece of land is now home to an estimated 1900 of these speedy creatures. Pronghorn Antelope populations once exceeded 30 million animals, but by the turn of the century, was down to just a few small bands. 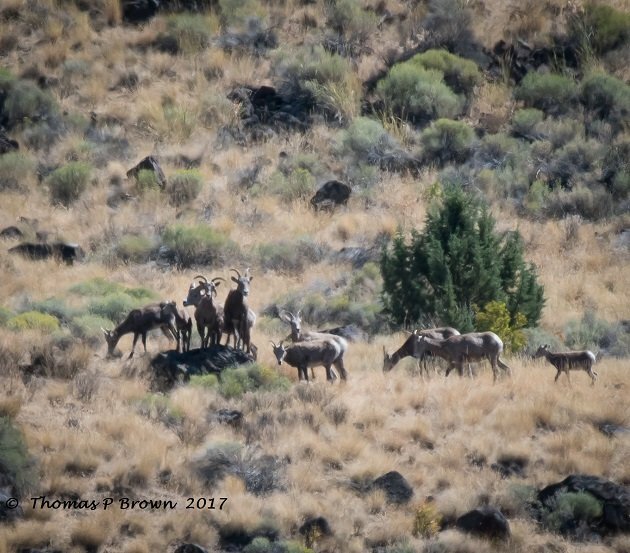 The other remarkable success story of Hart Mountain is the return of the Desert Bighorn Sheep. The combination of over hunting, and the native animals susceptibility to diseases carried by domestic livestock that were allowed to graze there, completely eliminated these Bighorns by 1915. In 1954, with stringent controls on the grazing of domestic animals, a herd of 20 Desert Bighorn Sheep were re-introduced and have flourished. The population is now estimated to be at over 500. This small group of Pronghorn Antelope were right at the refuge entrance. I guess they were the greeters! So much for the history of the area, lets talk about the birds! Home to over 200 species, this amazing area is quite susceptible to the amount of rainfall each year. With an annual average of 12″, most of which is in the form of winter snow, or spring rains, the many potholes, ponds, and creeks can be full one year, and bone dry the next. The last few months, prior to my arrival have been very wet, so when I visited, I was quite amazed at the amount of water everywhere. With water, comes birds, so I set off in search. Now, I was a bit limited where I could go, due to my rental cars capabilities, and I am pretty sure the rental agency would have had a fit if they saw where I did manage to go! My trip out to hart mountain began well before sunrise, nearly 65 miles away, in my home town of Lakeview. I wanted to be at the base of the mountain by sunrise, hoping to catch some of the early risers. Once at the base, and the refuge boundary, you begin a slow winding rise up the mountain. This is a decent gravel road, just a bit wash-boardy, but I continue on, and then I break over the top, the sun is just coming up, and it is magic! I am sure that for most eyes, the wide open expanse and desert would receive little favor, but to me, I know the stories that have been borne here, the history of the amazing area, and the diversity of the wildlife that can be found here. I feel like I am home. 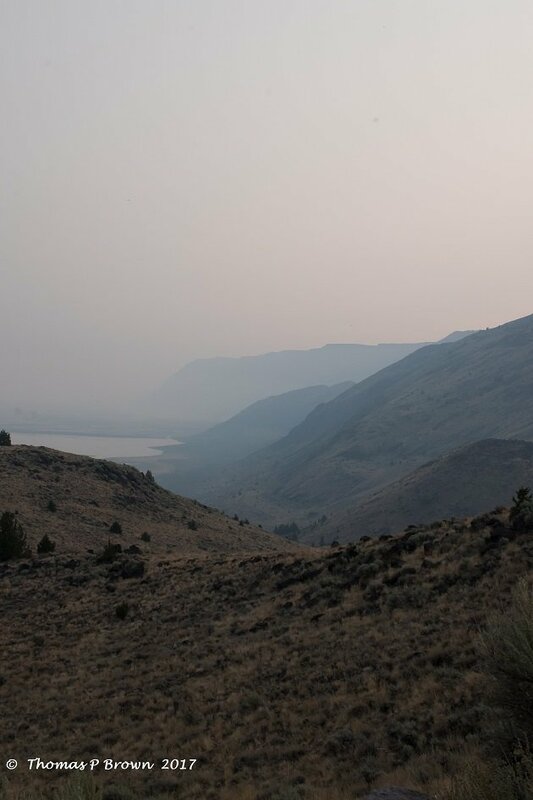 Below is a view from about half way up the mountain, as you can see the smoke is terrible. I have to admit, the whole trip here, was about finding some of the Greater Sage Grouse. They were such a common bird when I was kid, running around the refuge, driving the old farm truck, when I was a few years shy of the legal driving age. 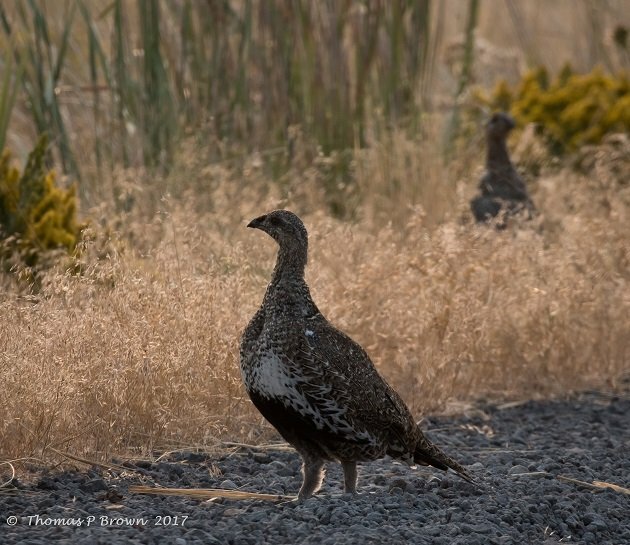 Populations of Greater Sage Grouse here on Hart Mountain have steadily declined from a peak of 8750 birds in the 1940’s, to a current level of 800 to 1000. After a quick stop at the refuge headquarters, I headed down the road to the Hart Mountain Hot Springs. There is a small meadow, lined with Aspen and Willow trees along the creek that flows thru it. It is in this meadow that a natural hot spring comes to the surface. Many years ago, there was a cement pad laid around it, and more recently a small privacy wall built as well. This is also one of the best birding hot spots on the mountain. I was not even 100 yards from the headquarters, when off to the left hand side of the road stood three Greater Sage Grouse! They were quite unconcerned with me and my bright red rental car, continuing to pick gravel at the roadside. This was just too easy, I could have turned around right there, my primary goal had been completed, but, no, not really. I still had several hours left, the sun was barely up, and I had more birds to find. The day actually turned out to be a little less productive than I had hoped, but it was such a joy to be back in one of my absolute favorite places on this Earth. Here are a few of the photos that I managed to get despite the overall haze from the forest fires that have been raging all over the state. 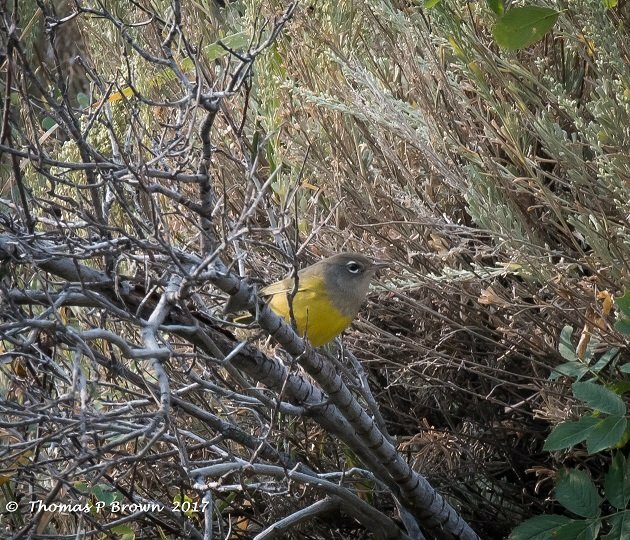 Here was my first surprise, an Mac Gillivray’s Warbler. 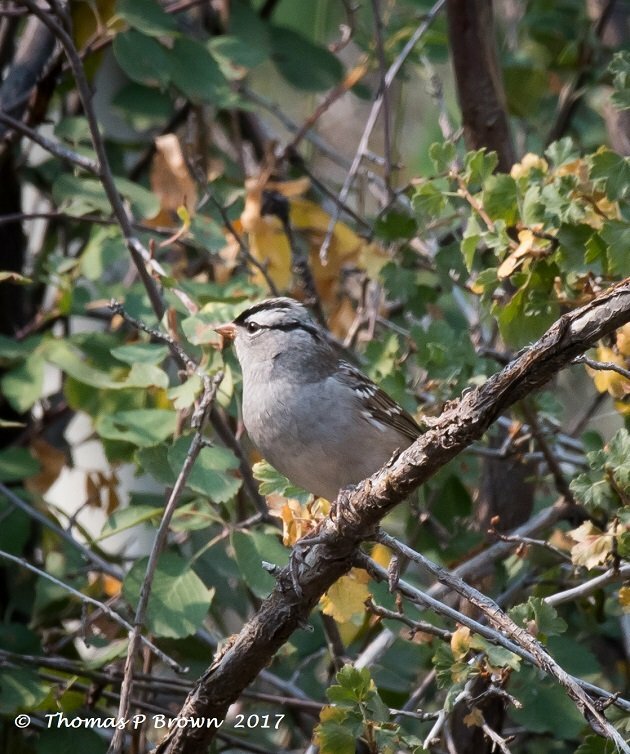 A White-crowned Sparrow is always a beautiful subject! 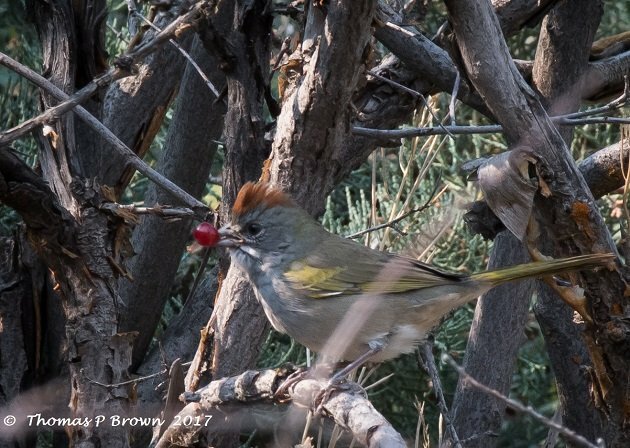 The refuge volunteer biologist had mentioned seeing a Green-tailed Towhee near the campsite, and there it was! 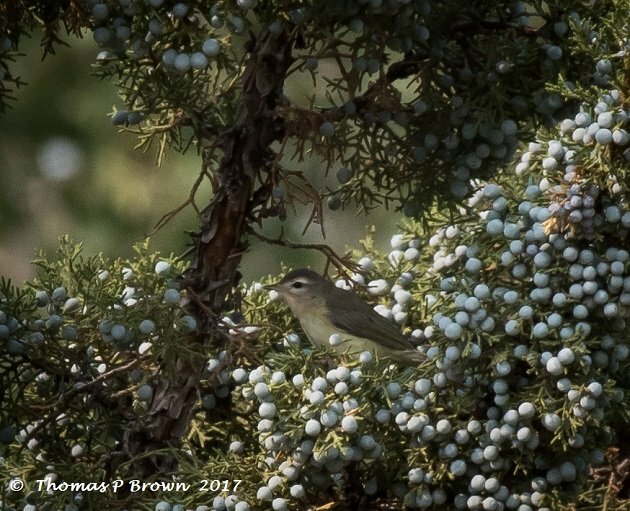 A new Lifer for me, a Warbling Vireo was staying close to the juniper berries. Not sure what insect it was finding in there, but it had no intentions of leaving! 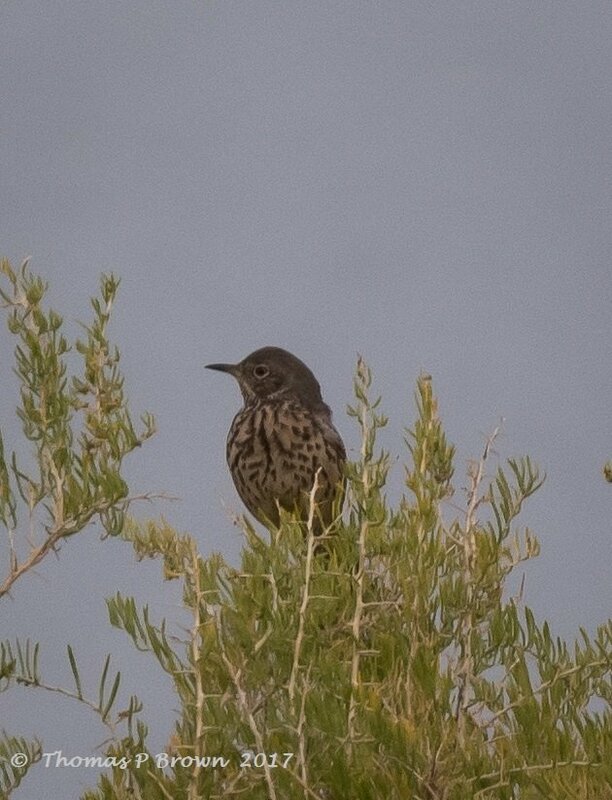 This Hermit thrush was almost missed, in all the smoke, but I did manage to get a couple of decent shots. 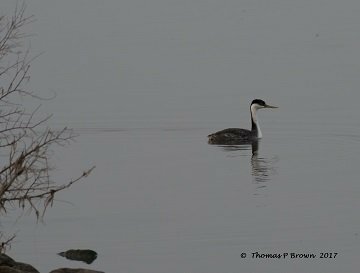 On my way into the park, I spotted this Western Grebe, feeding along the shore. 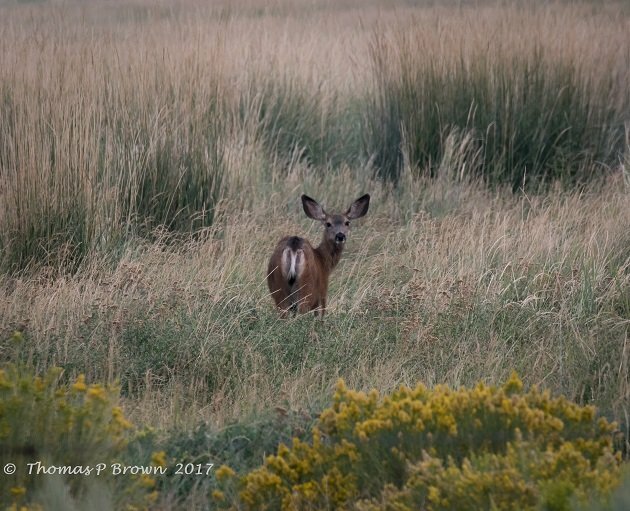 I had the antelope greet me on my way in, and this Mule Deer doe, was there to say goodbye on my way out. I will close out this rather long entry with a quote that I found that is very close to my heart. It was written in 1960, by then Justice of the Supreme Court, William O Douglas. ” I always feel sad leaving Hart Mountain. Yet after I travel a few hours, and turn to see its great bulk against the sky, my heart rejoices. The refuge will leave our grandsons and granddaughters an inheritance that no dollars could recreate. Here they will find life teeming throughout all the life zones that lead from desert to alpine meadows.” I could not have said better. What a wonderful post! As an Oregonian I too love our special outdoor places. I’ve been reading Justice Douglas’s books including “East to Katahdin”. Ryan Zinke should be required to read them! Great post. I need to get out there at some point.